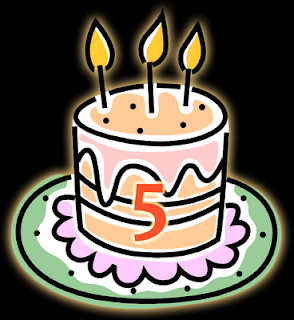 Has it really been five whole years since I started this humble blog? The short answer is yes. Yes, it has. A lot has happened in the last quinquennium... more than I can ever hope to have written about. And so, as I've done so faithfully in the past, I whipped up another Bloggy cake in celebration of this achievement. That said, it wasn't that easy. It's getting harder and harder to find good clip art birthday cakes. Yes, I do have certain standards when it comes to selecting clip art cakes, the biggest being that it has to be workable with the black background of this blog (which, much like the title, I've been meaning to change for a long while, but I haven't yet found the motivation to come up with anything better). And it has to be somewhat professional-looking. I mean, clip art is vectorized by definition. For some reason, people think that the things they draw with the "pencil" tool in Microsoft Paint qualify as "clip art." (Hint: They don't.) As far as I'm concerned, they're just drawings. And while some of them are very nice, many aren't... and in any case, they're not what I'm looking for. Still, is it so much to ask that new and halfway decent clip art images of birthday cakes be uploaded to the web and make their way to the first 20 or so pages of Google's results at a minimum rate of one per year? The short answer is yes. Apparently, it is. Maybe in future, I'll actually use 14 May as an excuse to bake a real cake. But for now, this digital cake is my sincere thank you to the 1160 visitors this blog received during its fifth year. Yes, that's down 53%, but it's completely understandable as I've written 66% fewer posts with 71% fewer words. In my defense, for much of the past twelve months, I've been a senior at university who has neither been traveling abroad nor attempting to blog every day (and even being way too busy to write every other day, let alone more than once in April). But "I'm not dead yet... I'm getting better...," er, something like that. Anyway, in addition to the admittedly contrived and self-centered celebration of five years of admittedly poor blogging, tonight I'll be celebrating my friend's 22nd birthday (which was yesterday), and on Sunday my home church will be celebrating its 175th anniversary... both are significant achievements, if you ask me. Here's hoping I'll see you again soon... whether in person or in the blogosphere! I should note that these figures were somewhat hastily calculated/estimated (and obviously do not include this post). As such, they might be a tad off. But they're certainly close enough and I don't particularly care to go back and figure it out exactly.